By the time you read this, Phil Mayhew will have just celebrated the 50th anniversary of the first pot he ever threw. Little did he know at the time that his life would one day be legacy of pots, mugs, bowls and other porcelain ceramic pieces of artwork. It was the beginning of the summer in 1968. Phil had been to Walasi-yi several times before. As a ceramics student at UGA, he often fled Athens as the football games brought a commotion to the city and drove to the mountains for a respite. Often times he would stop at Neel Gap, sometimes hiking north to Leveland Mountain and other times going south up Blood Mountain. But he had never been inside until that May. Phil Mayhew and his wife Terri on the overlook. It had been uninhabited for several years at the time and he quickly began building shelves to fill the dining area of the old restaurant as soon as he moved his family in. As a fresh graduate of UGA’s MFA program, he found himself to be the first caretaker of Georgia Mountain Arts, a small organization whose goal was to provide an outlet for craft art done by poor mountain people in the local area. This included knitted bonnets, sewn quilts, wood carvings, pottery and so much more. Phil passed by a well paying job teaching crafts for the Army in order to take the low paying job at Georgia Mountain Arts that placed him in the heart of the mountains he loved so dearly. 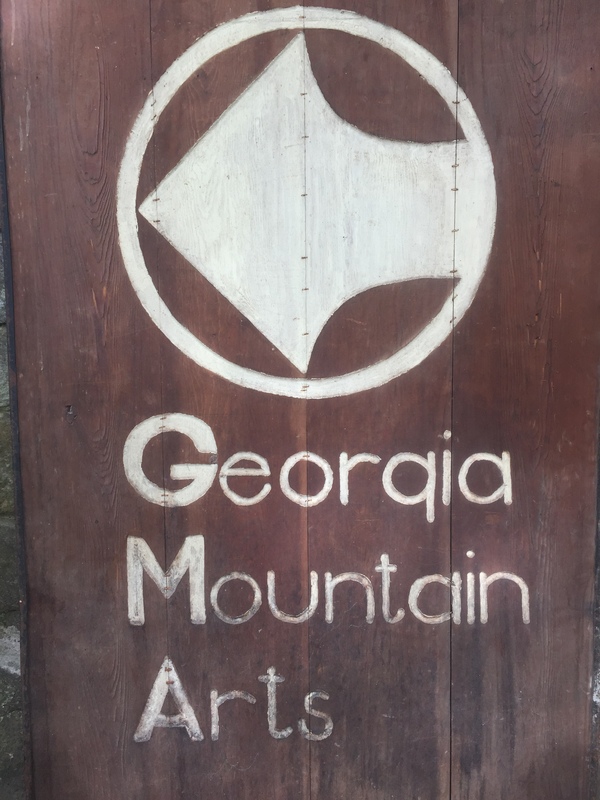 This Georgia Mountain Arts sign used to hang where the Mountain Crossings sign now hangs today. When he wasn’t manning the little shop full of crafts at Neel Gap, Phil would stop by the small shacks and cabins of the artists he represented to collect more work to sell, using a small amount of money he was allotted to purchase works from local artisans. He would learn of these remotely located mountain men and women by inquiring at local country grocers. Just a few simple questions about carvers, weavers, whittlers and the such in the area and he would be on his way to hunt them down. The program’s main aim was to put money in the hands of extremely poor people living in the mountains while at the same time recognizing their craftwork as art and bringing it the proper acclaim. Phil grew long lasting friendships with some of the artists as he went to visit them and watch them work, learning what he could from them. Gerogia Mountain Arts also allowed several other artist to put their work on consignment in the shop. Among those was Phil, who has continued to sell his pottery at Walasi-Yi since then, 47 years ago! 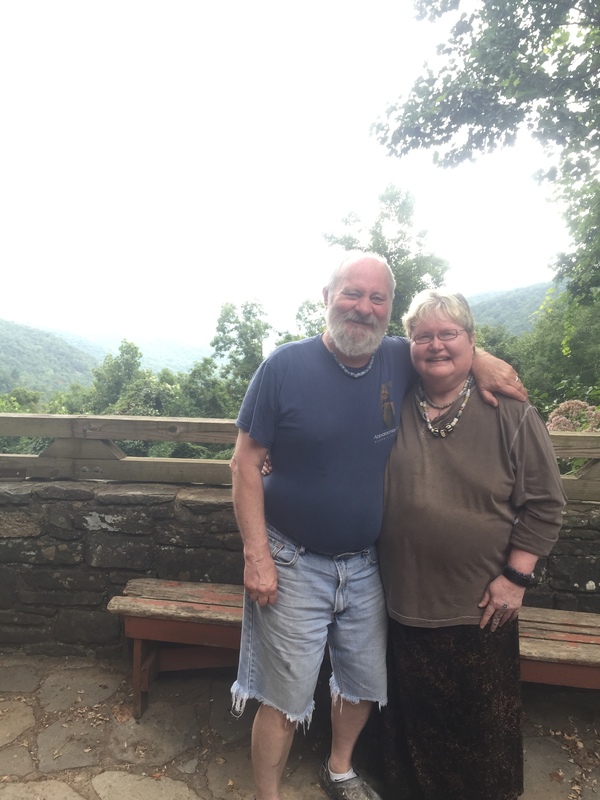 He now lives in Beersheba Springs, Tenneessee with Terri, who is also an artist and musician like Phil. Their lives work have a far and wide grasp. Their family like business, Beersheba Porcelain, encompasses their ceramic works and their jewelry. Several friends work with them but all are treated like family. Mugs, bowls and pitchers by Phil Mayhew, available at Mountain Crossings. Georgia Mountain Arts only last a few years at Walasi-Yi yet it still made up some of the more colorful history of the building. Even then, Phil remembers inviting hikers to rest their weary heads as they hiked through. Several even sent him a letter in the mail to inform them of their success in reaching Katahdin. Phil went on to be a ceramics professor for several years until he decided to pursue pottery full time in 1973 and had been focusing solely on creating beautiful works since then! You can see a variety of his work on his website and find some for sale at Mountain Crossings! This entry was tagged appalachian Trail, arts, craft, georgia mountain arts, History, mountain arts, mountain crossings, Neel Gap, pottery, Walasi-Yi. Bookmark the permalink. I’ve know Mayhew pottery since I was a little girl, named Tina Ward. I just now purchased my first mug and I’ve never felt so proud and grow up!! I stumbled across an arts shop on my way from Knoxville to Nashville one sunny day in the mid-1990’s. I had time to spare as I wasn’t due in Nashville until the following day so I looked around the shop. I came across some beautiful mugs and purchased six of them for my wife who likes and enjoys lovely works of art. I brought them home to Richmond, Virginia. A few years later we moved from the city to a rural mountain cabin we had built on top of Tobacco Row Mountain in Amherst County, central Virginia. One day I sadly scraped one of the mugs and the glaze developed a hole. The mug leaked. I contacted the Mayhews describing my situation and Phil made a new mug in the style of the one I damaged. We still have all seven mugs. I use the damaged one as a pen and pencil holder on my desk. I not only drink from art work I can see it when I’m working as well. Thank you Mayhews for helping brighten my days.